Editors : by Rahaab Allana and Pramod Kumar K.G. 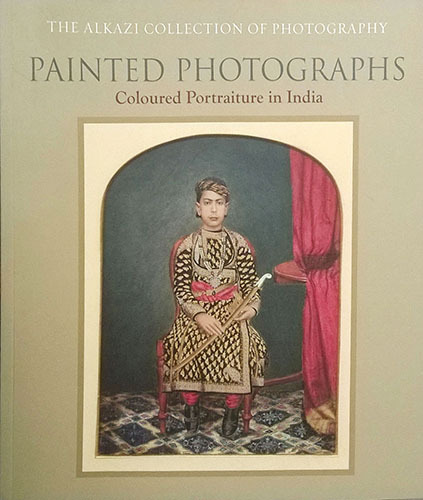 This volume explores the development of the embellished image in India through the painted photograph, a genre that marks a significant chapter in the history of Indian photography. A crucial embodiment of the colonial encounter, these images abet the notion of modernism in visual practice at the turn of the 19th century. Successfully incorporating existent Indian traditions of illumination in painting, the painted photograph slowly emerged as a self-sustaining convention, a meld of realistic documentation and artistic manipulation that was also a legitimate expression of popular culture. The bold alchemy of brush and lens enabled a riveting third artefact, a synthesis of painting, photography and printmaking—modern art forms that affirmed the links between regional aesthetics, technological innovation and the urban market. These alluring, ambivalent compositions offer an inter-pictorial approach to reality, a remarkable mode of simulation provoked by cross-cultural aesthetic codes as well as profound sociological change. Rahaab Allana is Curator of the Alkazi Foundation for the Arts in New Delhi. He completed his M.A. in Art History from the School of Oriental and African Studies, London, in 2001. He has worked as Assistant Curator at the National Gallery of Modern Art in New Delhi, and is the author of Inherited Spaces Inhabited Places (2005), a volume on World Heritage Sites, published by the Ministry of External Affairs, New Delhi. Pramod Kumar K. G. was Associate Director at the Alkazi Foundation for the Arts in New Delhi. Founder Director of the Anokhi Museum of Hand Printing at Jaipur, he was Director of the Jaipur Virasat Foundation in 2005–06, and of the Jaipur Heritage International Festival and the first Jaipur Literature Festival in 2006.